The incredible popularity of the PopaBall Range! We know so many of our customers who have embraced this exciting range of fun, bursting bubbles and swirling shimmer that can pimp your Prosecco and add a little more pop to your gin and tonic. Bringing a fab pop of fun and fruity flavour to cocktails, sparkling and soft drinks, or a mesmerising swirl of iridescence to your fizz, it’s clear that you’ve embraced the idea of pepping up your drinks with these secret ingredients to add instant wow factor. Whether you’re popping the cork on a bottle of sparkly in celebration of something, gathering some friends together for a catch-up, or simply celebrating the fact that it’s Friday night, there’s a quick and simple way to make a tray of Prosecco glasses look stunning, and that’s with a tiny little pot of magical pink powder, otherwise known as Prosecco Shimmer. Fill your flute three-quarters full with Prosecco, slowly sprinkle in a little of the Prosecco shimmer dust, watch as the drink in front of you bubbles up then clears to reveal a beautiful fizzing, swirling, rose gold shimmer. Giving your drink a subtle raspberry flavour and a hint of pretty pink, did you know that this glittery powder also contains teeny-tiny, heart-shaped pieces of edible gold leaf which will make your drinks even more glam and glitzy? So the next time you find yourself opening a bottle of bubbly, just grab yourself a pot of shimmer for Prosecco too, serve your drinks then sit back and wait for all the oohs and aahs to follow! For a slightly less glitzy – but just as delicious – drink addition, look no further than the original PopaBall Bursting Bubbles for Prosecco. They’ve been flying off our shelves since we first started to sell them back in 2015, and these fruity pops of strawberry flavour are a far more fun twist to a plain old glass of fizz. Not that there’s anything wrong with a plain old glass of fizz, but if you’ve yet to try these bursting bubbles, well, where have you been? An instant way to give drinks an unexpected fix of fruity flavour, these Prosecco balls are made with real fruit juice and can be added to Prosecco, champagne and other sparkling wine as well as cocktails and soft drinks. One tub provides between 3 and 6 servings and also includes a telescopic straw, so you can have even more fun sucking the bubbles up and feeling them burst with juicy flavour in your mouth! Prosecco bubbles are also available in a duo pack of Strawberry & Peach Bursting Bubbles – two tubs for twice as many tantalising tastes. Or why not try Cherry Shimmer and Bursting Bubbles – the best of both worlds as far as we’re concerned, since you get a little pot of cherry-flavoured bursting bubbles bobbing around in a shimmery liquid that will make your Prosecco shimmer and sparkle so it looks the part and tastes amazing. And if you’re looking for a little inspiration for your Prosecco cocktails, look no further than our shimmer-gilded and poptastic twists on classic cocktails – Shimmery Bakewell Fizz, Prosecco Rose Royale, Cranberry Swirl Punch, and Popping Prosecco Raspberry Bellini with strawberry-flavoured bursting bubbles. The entire PopaBall range is perfect for adding a touch of glamour to weddings, engagement parties, birthdays, hen nights, movie nights, Friday nights, Saturday nights… really, any night that you can think of when you might enjoy turning a little Prosecco cocktail or two into a night to remember! Each pack also comes with a serving suggestion on the side of the box, should you need a little extra inspiration. The popping balls are gluten free and suitable for vegetarians, vegans and coeliacs, and with only about 100 calories in a little tub, your waistband won’t need to worry either. Not just the realm of flutes of fizz, even your vodka or gin and tonic can get involved in the fun thanks to PopaBall for gin. These days, it’s not enough to just add ice and a slice – all sorts of botanicals and additions can go into your g & t. Our favourite drinks addition? By far PopaBall’s Bursting Bubbles For Gin – juicy little bursting bubbles flavoured with blueberry and lemon. Add a spoonful to your gin cocktails, watch the bubbles slowly dance their way through the fizzy tonic and up the glass, then use the straw to get them all and bite down to release the scrummy taste. It got us thinking – PopaBalls are such a simple way to finish off sparkling drinks and cocktails, what else might benefit from a tasty transformation? 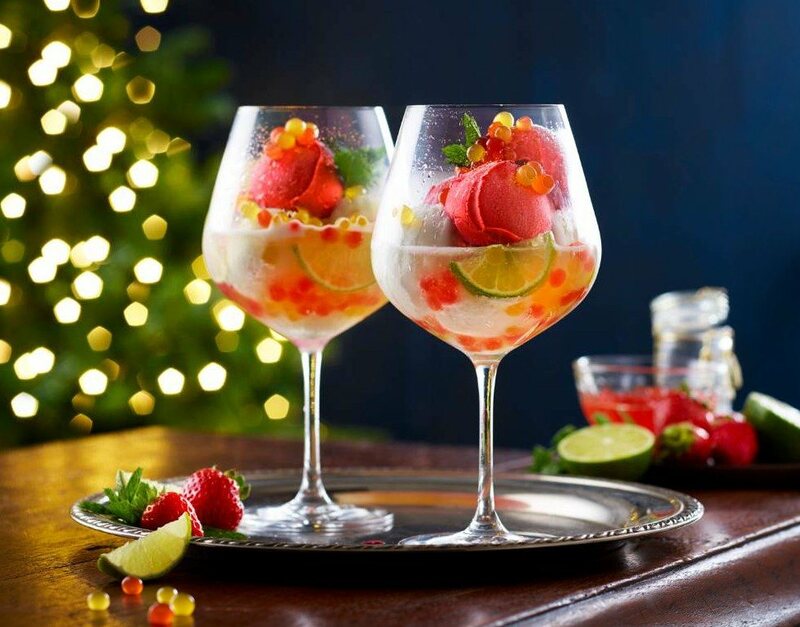 What could be easier than turning a simple bowl of ice cream or a dessert into a really special treat than by sprinkling on a little bit of sparkly magic shimmer dust just before you serve, or scattering a colourful burst of PopaBall Bursting Bubbles for a fruity flourish of flavour? 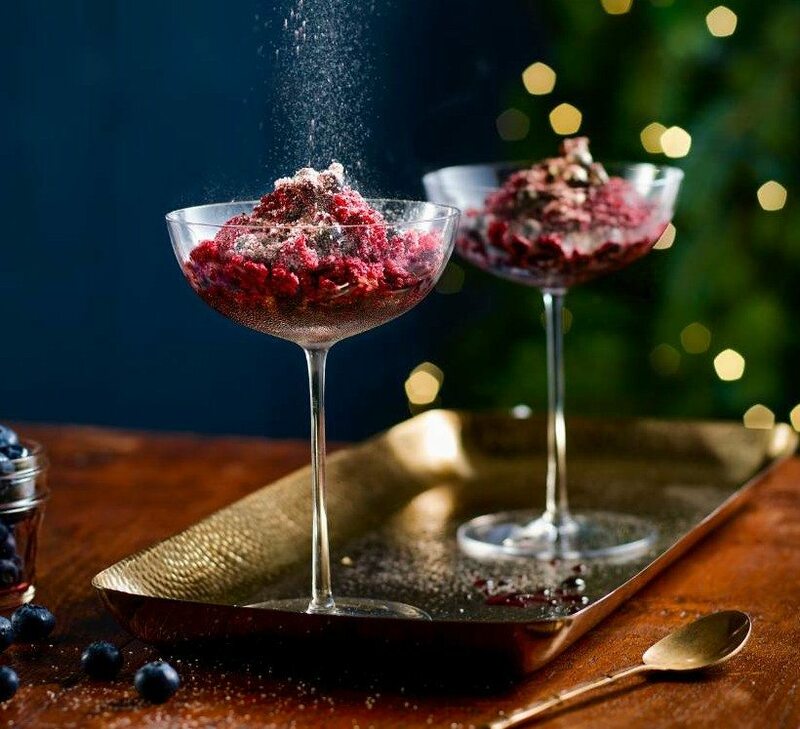 We took our Blueberry Granita recipe and sprinkled a subtle dusting of Shimmer and a spoonful of the blueberry gin bursting bubble PopaBalls on top right before serving, because who wouldn’t be wowed by sparkling scoops of ice cream or a glittery granita? To make our Mini Rose Gold Raspberry Cheesecakes we mixed Shimmer into the top layer them served them topped with strawberry Prosecco bursting bubbles for individual dinner party desserts to wow. Or how about little cubes of jelly with PopaBalls suspended inside? Serve them with a scoop of shimmer-dusted sorbet or ice cream for a perfect PopaBall pairing. And as for a showstopping centrepiece, we’ve done that too – we topped our indulgent Black Cherry & Vodka Trifle with shimmer cherry PopaBalls alongside fresh cherries and miniature meringues for a dessert that wouldn’t look out of place at a dinner party or celebration meal. The world’s your oyster really when it comes to pimping up your puds with PopaBall Bursting Bubbles or Shimmer – swirl them in, sprinkle them on, decorate with them, serve them on the side… just remember to add them right before you’re serving your food so they stay nice and fresh and fruity. There are many more ideas to help inspire you on our website – check out our recipes for Mini Meringues garnished with Strawberry PopaBalls, Strawberry & Limoncello Sorbet with Strawberry & Peach PopaBalls and Prosecco, and Shimmery Strawberry Jelly with Coconut Panna Cotta – but we’d love to hear what you’re doing with yours too! Let us know and share your pics with us on Facebook and Twitter.